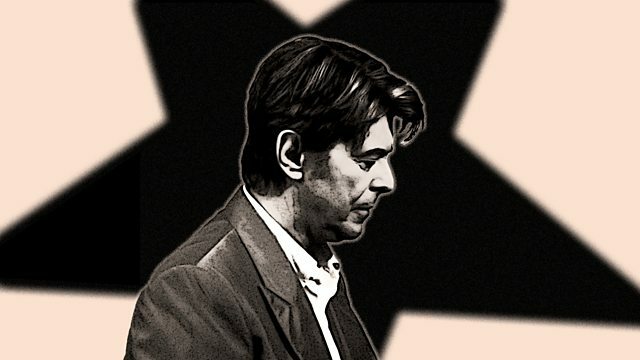 A dramatised account of David Bowie working on his last album, Blackstar. ** For rights reasons, this programme is no longer available. This special drama is an imagined account of David Bowie as he works on his last album, Blackstar, to give a moving and revealing portrait of the star as he reflects on music, love, drugs, fame and death. Impressionist Jon Culshaw, in a rare serious role, plays David Bowie. It is 2015, and music star David Bowie is secretly working in New York’s The Magic Shop studio, with his long-time producer Tony Visconti. The resulting tracks will become David Bowie's final album, Blackstar, which was released in January 2016, just two days before his death. The dialogue in this drama is partly constructed from Bowie’s own words, taken from the many hundreds of interviews he gave since the 1960s. What made David Bowie create all his characters? What did the first rush of fame feel like for David Bowie? Incidental music was by Chris O’Shaughnessy and Sandra Mae Luykx. 2 He was afraid of becoming mentally ill, like members of his family. 3 He lived longer in New York than in London. 4 He told the BBC that he considered himself a recovering alcoholic. 5 He made $55 million from “Bowie Bonds” - an innovative way to exploit his back catalogue. 6 He met producer Tony Visconti back in 1967. 7 He lived in Berlin with Iggy Pop in 1977, where he got about by bike. 8 He liked to wear slippers in the studio. 9 He invented Ziggy Stardust and other stage personas because he lacked confidence in his singing voice. 10 He was working on new tracks after he recorded his last album, Blackstar.